Discover a heavenly place: peace, wide open spaces, friendliness, magic places. An ideal place for work, relaxation and togetherness. Please contact us for a quote, which we will adapt and modify according to your wishes and your budget. Let your children find their most beautiful memories! Why not have a massage session? PROMOTION JULY 2018 Residence LA PALMERAIE “3-star rated” great comfort from 12 to 15 people maximum, indoor swimming pool, water overflow spa at 35 °, total immersion of the body, massage seat, Sauna, fitness room. Set of three cottages “classified 3 stars” of 20/24 people. private indoor pool, spa water overflow at 35 °, total body immersion, massage seat, Sauna, fitness room. From 21/07/18 to 28/07/2018: 5290 € instead of 5690 € all charges included, cleaning, beds made on arrival. 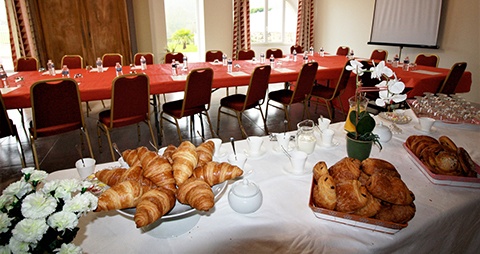 of the domaine for your business meetings ! In the cottages of the Estate de la Rebière, situated in the Dordogne in the Parc naturel Régional Périgord Limousin, in a peaceful, restful and nature setting, you will find the necessary peace and quiet in which to either work or relax. Organise your stay according to your wishes around a very comfortable accommodation that can take up to 40 people.